An update will cap the Note 7′s charge at 60%, but it’s unclear if Samsung will roll it out worldwide. SAMSUNG PLANS TO issue a software update for its recalled Galaxy Note 7 smartphones that will limit battery recharges to 60%, and prevent them from overheating. The front page of the Seoul Shinmun, a South Korean newspaper, carried a Samsung advertisement on Tuesday announcing the software update for any users of the Note 7 who may be disregarding its recall notice and continuing to use the smartphone. “It is a measure to put consumer safety first but we apologize for causing inconvenience,” the advertisement by Samsung said. The update for South Korean users will start 20 Sept, it said. South Korean media earlier reported the software update plan, citing Samsung. It was not clear when the update may be issued overseas. Also unclear was whether it would be forced on existing Note 7 phones regardless of user consent. Yonhap News Agency reported that Samsung is in talks with mobile carriers to deliver the same update to keep battery power at 60% or below at all times. The planned update is the latest action Samsung has taken as it deals with faulty batteries in certain Note 7 devices. Numerous reports of the Note 7′s batteries exploding and catching fire have surfaced, including one incident which saw a six-year-old end up with burns to his body after using it. Concerns were so great that a number of aviation companies told passengers not to charge or turn on their Note 7 while flying. Samsung recalled 2.5 million of the devices just two weeks after their launch, saying the problem stems from a manufacturing glitch in the batteries. The company did not say how many more battery fires in the Note 7 have been reported since 1 Sept when 35 cases were confirmed. In announcing its recall, the Canadian government said one case was confirmed in Canada while Samsung received more than 70 reported cases in the United States alone. The US Consumer Product Safety Commission is considering an official product recall. Samsung is the world’s largest smartphone maker, and analysts said the recall might leave a larger impact on its brand than earlier estimated. The problem saw it lose $26 billion (€23.13 billion) in value despite strong sales with the S7 and S7 Edge this year. The company has urged consumers to immediately turn off the phones and get them replaced with the new Note 7. It has also started marking safe Note 7 devices with a blue ‘S’ so consumers know it’s not hazardous. But implementing such a large-scale recall is a challenge. 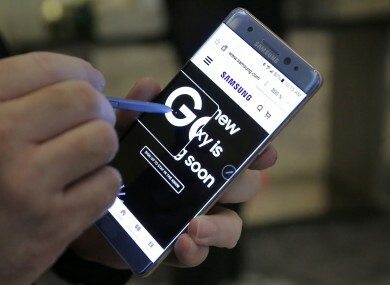 Consumers have to visit Samsung service centers or retailers twice – once to get a replacement phone – not a Galaxy Note 7 – and have a safety check of their existing Note 7, and a second time to get a new Note 7. The exchange of Note 7 devices for Irish customers will begin from 19 September. Email “Samsung's quick fix for the Note 7's exploding battery problem? Stop it from fully charging”. Feedback on “Samsung's quick fix for the Note 7's exploding battery problem? Stop it from fully charging”.